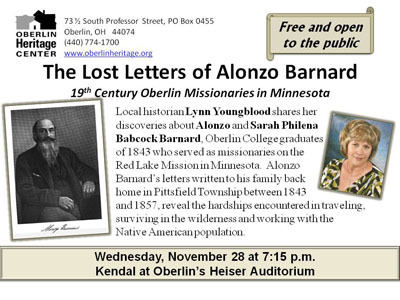 November 28 (Wednesday, 7:15 p.m.) Alonzo Barnard and the Oberlin Band: 19th Century Oberlin Missionaries in Minnesota. Oberlin Heritage Center member and local historian Lynn Youngblood presents her discoveries about Alonzo Barnard and his wife Sarah Philena Babcock Barnard. They graduated from Oberlin College in 1843 and then went west to serve as missionaries on the Red River Indian Mission in northwest Minnesota. Lynn uncovered letters written between 1843 and 1857 where Alonzo shared their stories with family members who lived south of Oberlin in Pittsfield Township. This year marks the 150th anniversary of the bloody six-week U.S.-Dakota War that took place in September 1862 in Minnesota and which played a strong role in shaping its history. Location: Kendal at Oberlin's Heiser Auditorium.